Summary: The Dolphin Premiere is an outstanding floor cleaning bot, capable of picking up the smallest or largest debris. that said, it's not the best for vertical surfaces. And it's a bit heavy. Check out the Dolphin Quantum, too. A beast at cleaning floors. Can handle any type of debris using swappable filter media. 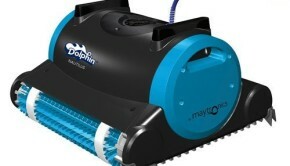 The Dolphin Premiere is an advanced residential pool cleaner made by Maytronics, the world’s leader in robotic pool cleaning technology. It was first released in 2013, and updated in 2016. 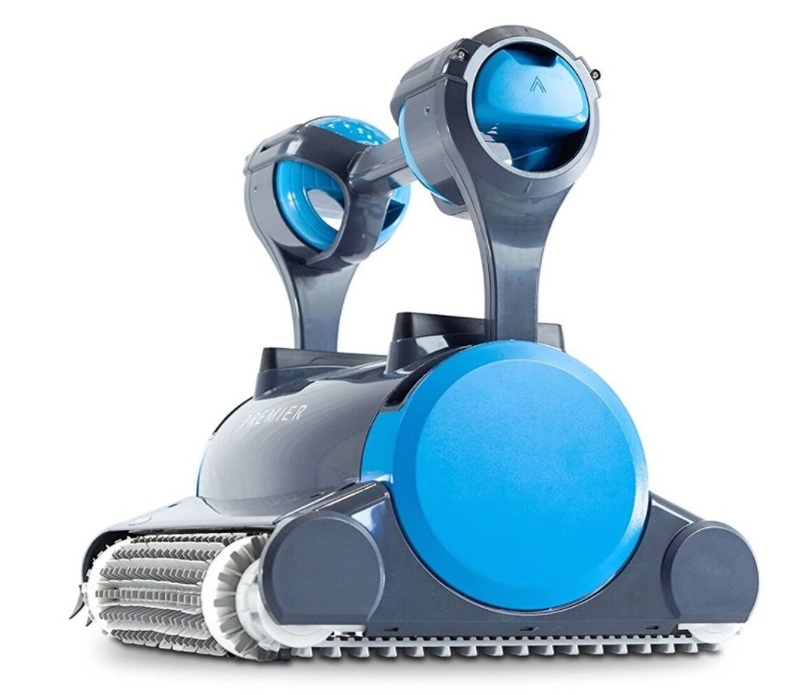 It one our favorite new robot pool cleaners, too. Packed with high-tech features, the Premier has a lot to offer, including Maytronics’ excellent SmartNav mapping system. It’s programmable, too, and can be run daily, 2x per week or 3x per week. It comes with a few quirks, however. The unit is heavy, so lifting it out of water may be hard on some. And, it’s not the best at cleaning steps. So… is the Dolphin Premier worth your money? Let’s dig deeper and see exactly what it has to offer and how well it cleans. Keep reading for our in-depth review. Based upon our review and other customer experiences, we have to give the Dolphin Premier a 4.9/5.0 in its cleaning performance. This is a very powerful, thorough cleaning system. It’s also intelligent, which keeps energy costs down. One of the most powerful features is Maytronics’ SmartNav scanning & navigation system. It scans and maps your pool and optimizes the cleaning process, ensuring that the Premier cleans quickly, efficiently and thoroughly. Like its cheaper above-ground sibling, the Dolphin Escape, the Dolphin Premiere uses a HyperGrip continuous rubber track system to keep the cleaner planted on the surface of your pool – whether it is moving along the floor of the pool, the steps or the wall. As it moves, two high-RPM brushes ensure that every inch of the pool is scrubbed clean. They are able to remove any stuck debris, including really small stuff like algae and bacteria. All these contaminants are then collected in a filtering media that you can choose. 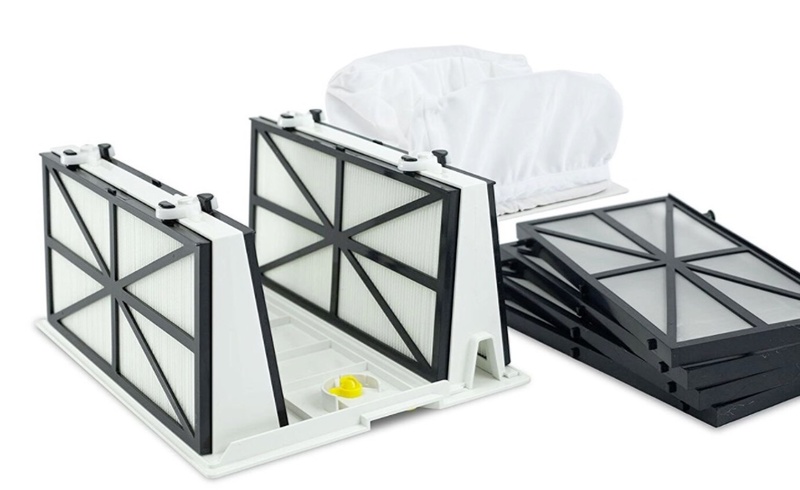 There are four different filters available for the Premiere, including micro-cartridges, standard filter cartridges, an oversized debris bag and disposable debris bags. This allows the cleaner to catch almost everything from large leaves and twigs to tiny algae and bacteria. The Premiere also includes an LED alert that tells you when the filter cartridge or debris bag is full. At the end of the cleaning cycle, your pool will be sparkling clean. Unfortunately, some vertical surfaces areas such as the steps may leave some manual work for you to finish. But overall, the new Dolphin Premier does a great job. 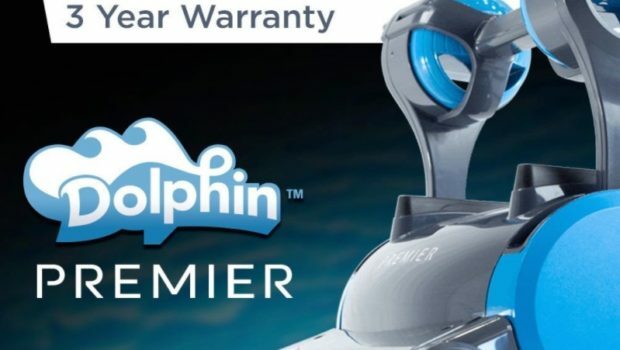 This is one of the most innovative features of the Dolphin Premier, and one that sets it apart from all other robotic pool cleaners on the market today. No one else offers it. The debris bags (permanent and disposable) are for capturing larger debris, such as twigs and leaves. Changing from one media to another is quick and easy. The Premier comes with SmartNav software to guide it on an optimal cleaning path around your pool. SmartNav scans all of your pool’s surfaces and decides the best path to take. Another thing the software does is ensure that the cleaner does not keep cleaning areas it has already cleaned, which would be a big waste of time and energy. Finally, SmartNav keeps the cleaner from getting stuck when moving over drains and other obstacles. Not only can it sense obstacles, it remembers them for next time. One of the most frustrating problems to encounter with any robotic pool cleaners is a tangled cable. Tangled cables can stop a cleaner in its track and, worse, force you to constantly keep an eye out for the problem. To prevent this, the Dolphin Premier comes with a proprietary anti-tangle swivel cable. 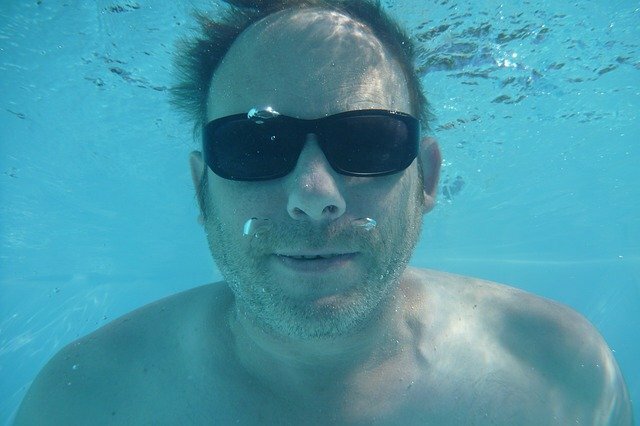 As the cleaner moves around in your pool, the cable is able to rotate a full 360 degrees. The Premiere’s 60-foot cable is made from thermoplastic rubber, which reduces frictional drag and allows better movement through the water. When in the pool, the Dolphin Premier is a beast. It’s able to move steadily, even along vertical walls. This is because the Premiere uses HyperGrip continuous rubber tracks, instead of wheels. By using tracks, the cleaner keeps a solid footing through the cleaning cycle. The tracks grip the surface strongly and counter any loss of friction caused by water. They also make it easier to climb over drains, steps and walls. 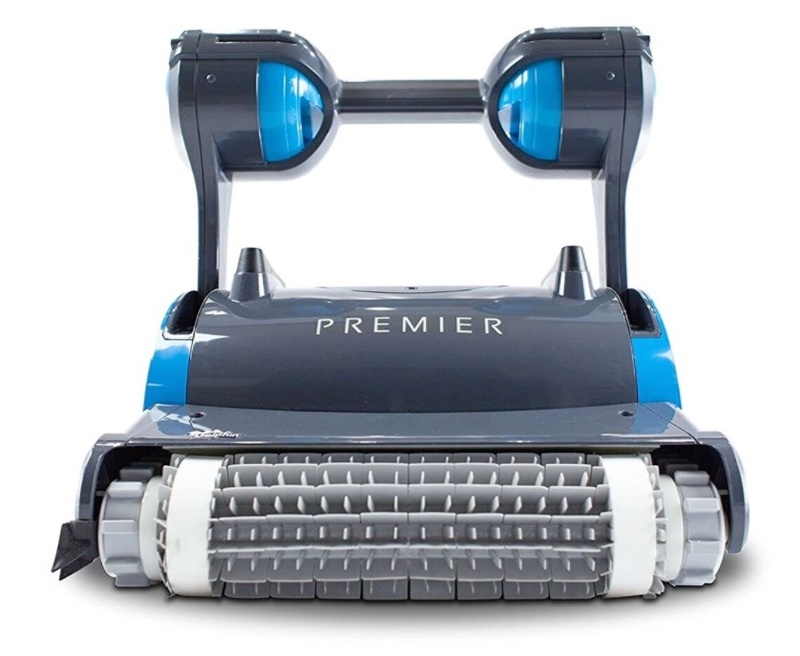 The Dolphin Premier uses two high-speed spinning brushes to get small debris and algae out of your pool’s floor and walls. 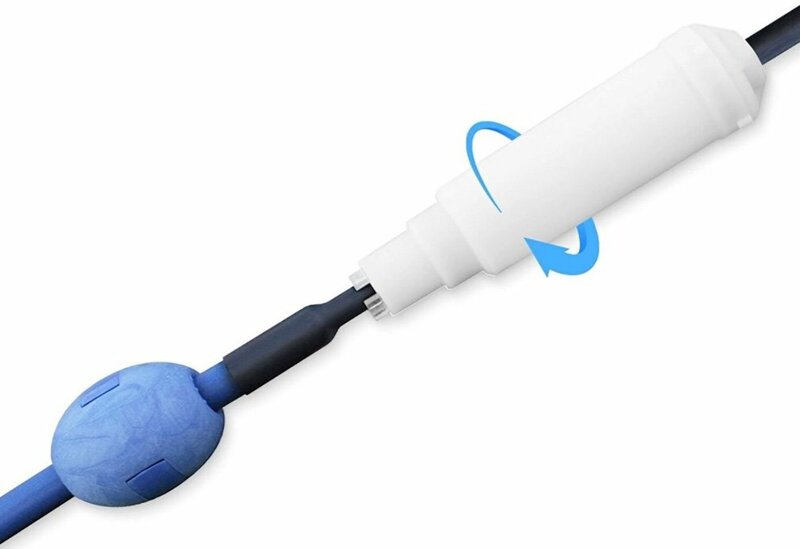 The PowerClean brushes are directed by the on-board software, as the cleaner positions itself so that the brushes can reach deep inside pool corners, the waterline and every inch on the floor. For such a highly engineered device, maintenance is usually a headache. And labor rates for robotic pool cleaner repairs are outrageous. Thankfully, Maytronics understands this problem and their engineers decided to build the Premiere using a modular component design. Motors, cleaning systems and even electronics can easily be easily removed and replaced, individually. Four filtration options make this cleaner perfect for those who have special needs (algae AND leaves, for example). SmartNav mapping system saves time, reduces energy cost and minimizes damage to your pool and to the cleaner, due to its built-in obstacle avoidance. Oversized debris bags can be a bear to clean. Not the best at cleaning steps. 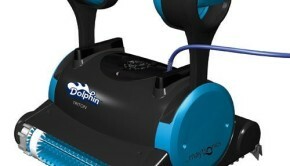 The Dolphin Premiere is a great choice for anyone with stubborn or unique cleaning issues on the floor of their in-ground pool. 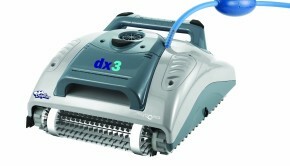 It’s programmable, has a remote and is a beast at getting things clean. 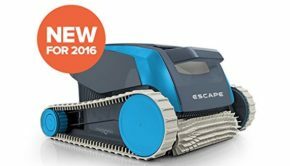 That said, if you also need your walls and steps cleaned thoroughly, then I’d suggest taking a look instead at Dolphin’s latest robotic pool cleaner, the Quantum.